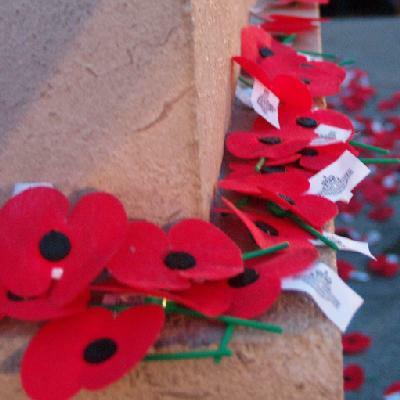 The Roll of Honour contains the names of all the men known to have served at one time with the New Zealand Mounted Field Ambulance and gave their lives in service of New Zealand. 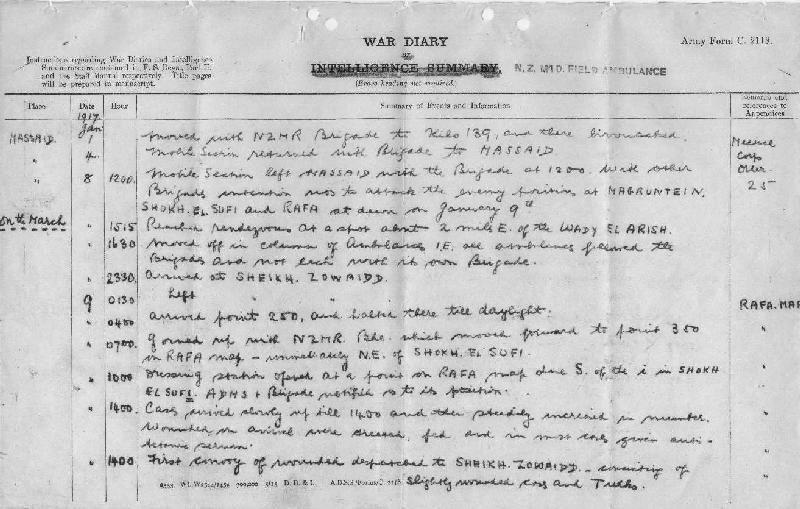 The following is a transcription of the New Zealand Mounted Field Ambulance, War Diary Account detailing their role at the Battle of Rafa, Sinai, 9 January 1917. 1200 Mobile Section left Masaid with Brigade at 1200. With other Brigades intention was to attack the enemy positions at Magruntein, Shokh el Sufi and Rafa at dawn on January 9th. 1515 Reached rendezvous at a spot about 2 miles east of the Wadi El Arish. 1630 Moved off in Column of Ambulance, ie, all ambulance followed the Brigades and not each with its own Brigade. 2330 Arrived at Sheikh Zowaiid. 0400 Arrived Point 250 and halted there till daylight. 0700 Joined up with New Zealand Mounted Rifles Brigade which moved forward to Point 350 on Rafa Map - immediately north east of Shokh el Sufi. 1000 Dressing station opened at a point on Rafa map due south of "I" in Shokh el Sufi. Assistant Director Medical Services and Brigade notified as to its position. 1400 Cases arrived slowly up till 1400 and then steadily increased in number. Wounded on arrival were dressed, fed and in most cases given anti-Actrime serum. 1400 First convoy of wounded despatched to Sheikh Zowaiid - consisting of slightly wounded cases and Turks. 1700 Received warning from Assistant Director Medical Services Anzac Mounted division to be ready to move at short notice the Tent Division. Wounded were accordingly loaded on to camels as rapidly as possible, and equipment was partially loaded on to the baggage camels. Order sent to Officer Commanding unit transport to evacuate all cases collected as rapidly as possible. 1720 Received order from Divisional Headquarters to withdraw as soon as possible. Order sent to Officer Commanding unit transport to send sand carts in the direction taken by New Zealand Mounted Rifles Brigade (which was commencing to withdraw) and not to send any further carts to New Zealand Receiving Station which had received orders to close. 1735 A Troop arrived from Divisional Headquarters, the officer of which had authorisation to act as rearguard to the New Zealand Mounted Field Ambulance. Order received from General Royston to withdraw immediately. 1800 Left Karm el Sufi and joined main body of troops now en route to Sheikh Zowaiid. 1810 Reported to Assistant Director Medical Services Anzac Mounted Division. 2320 Arrived at Sheikh Zowaiid. Wounded transported to 1st Australian Light Horse Dressing Station. 0815 New Zealand Mounted Field Ambulance left for Masaid which was reached at 1600. As at Magdhaba the number of sand carts was inadequate and provision for more lying down carts would make work of evacuation easier and more satisfactory in every way. The general transport taken proved to be ample. Many cases were collected and evacuated to another Ambulance unless seen by a New Zealand Mounted Field Ambulance Officer, such cases not included. Proportion of serious cases seemed about the same as at Magdhaba. 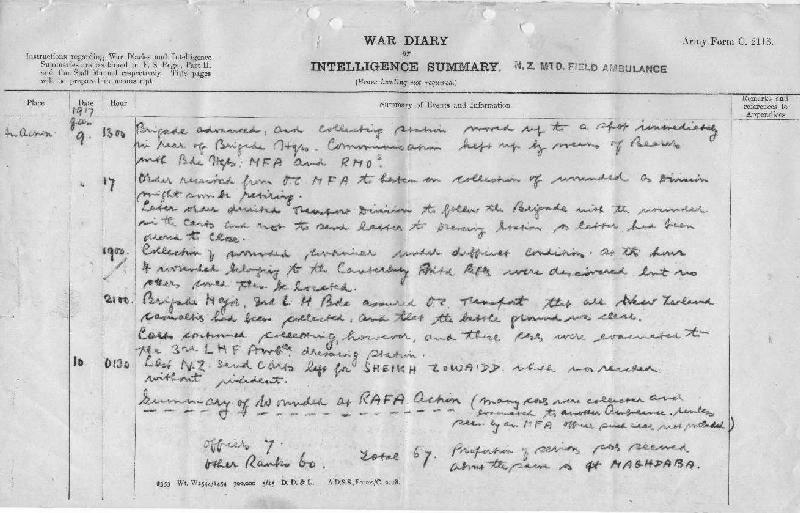 The following is a transcription of the New Zealand Mounted Field Ambulance Bearer and Transport Division, War Diary Account detailing their role at the Battle of Rafa, Sinai, 9 January 1917. 1000 Transport Division consisting of 8 sand carts and 4 sledges, together with the Bearer Division, moved off with the New Zealand Mounted Rifles Brigade. 1030 Collecting Station established on road near Brigade Headquarters and cases evacuated to Dressing Station. 1300 Brigade advanced and Collecting Station moved up to a spot immediately in rear of Brigade Headquarters. Communication kept up bey means of Bearers with Brigade Headquarters, New Zealand Mounted Field Ambulance and Regimental Medical Officers. 1700 Order received from Officer Commanding New Zealand Mounted Field Ambulance to hasten on collection of wounded as Division might soon be retiring. Later order directed Transport Division to follow the Brigade with the wounded in the carts and not to send latter to Dressing Station as latter had been ordered to close. 1900 Collection of wounded continued under difficult conditions. At the hour 4 wounded belonging to the Canterbury Mounted Rifles Regiment were discovered but no carts could then be located. 2100 Brigade Major, 3rd Light Horse Regiment assured Officer Commanding Transport that all New Zealand casualties had been collected and that the battleground was clear. Carts continued proceeding, however and these cases were evacuated to the 3rd Light Horse Field Ambulance Dressing Station. Rest New Zealand sand carts left for Sheikh Zowaiid which was reached without incident.